Butterflies and Chimes and is filled with beautiful melodic material. I originally composed this quartet after hearing (in 1998) a local university clock chime on the hour. It sounded beautiful. ..…a moment………. which I have tried to capture in this music. Originally composed between 1998 and 1999 it was first performed at a concert at Martin Luther Church, Vancouver, Canada on October 3, 1999. The variations on the main theme of Heaven Is like Butterflies Dancing was inspired by pianist David Hamilton's piano accompaniment for a hymn tune I wrote called The King of Love. and was first performed in a concert at The Lutheran Campus Centre at UBC, Vancouver, Canada on May 31, 1997. In keeping with the classical style there are minimal dynamics and articulations. 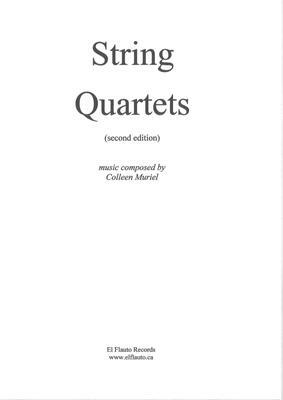 What do you want to know about String Quartets (second edition)?